As we were leaving Portugal to return to our “home for the moment” in Spain, we passed through the southern region which is well known for it’s cork trees. Portugal supplies the world with over 50% of the cork used to make wine and champagne “stoppers” (that’s what they call corks). We saw many of the trees in various stages of harvest from the highway as we drove south. 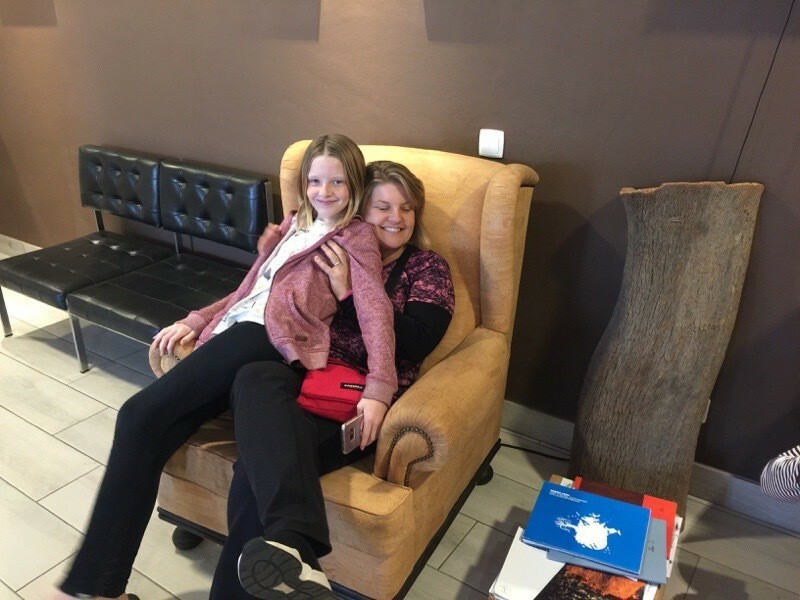 We felt it was a great opportunity for the somewhat unenthusiastic girls in the backseat, so we stopped at a cork factory and signed up for a tour. The kids know by now that even if they aren’t that interested, we may do it anyway. And it usually turns out to be quite interesting and they are glad we did it. This experience was one of those. 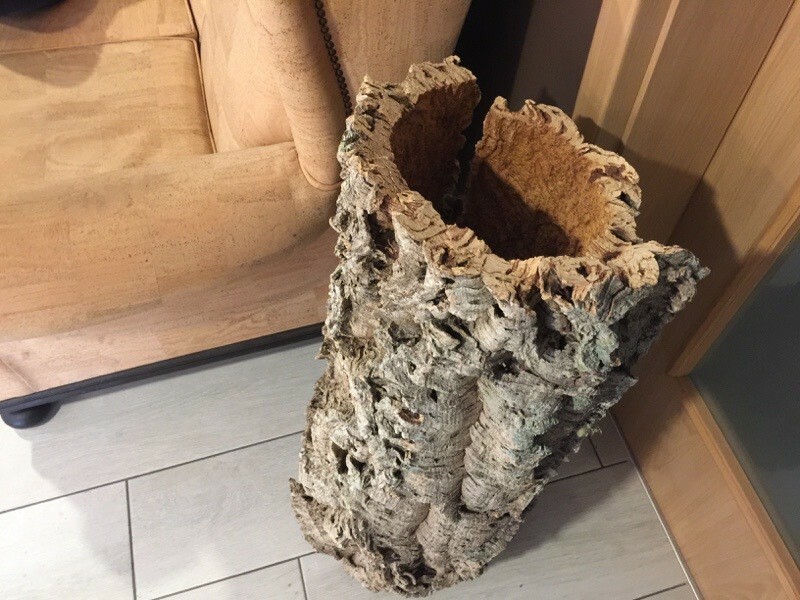 Everything in their lobby was made of cork. 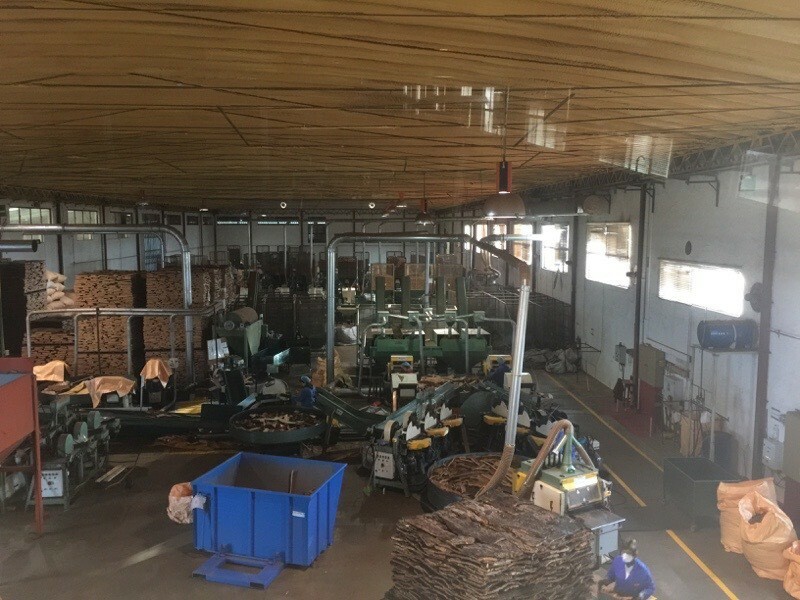 Turns out there are over 600 cork factories in Portugal, but we stumbled across this one with the help of TripAdvisor. We were happy to be the only people on the tour. Other people’s constant questions really slow down the pace of the tour. Or, according to Dan, my constant questions really slow down the pace of the tour. 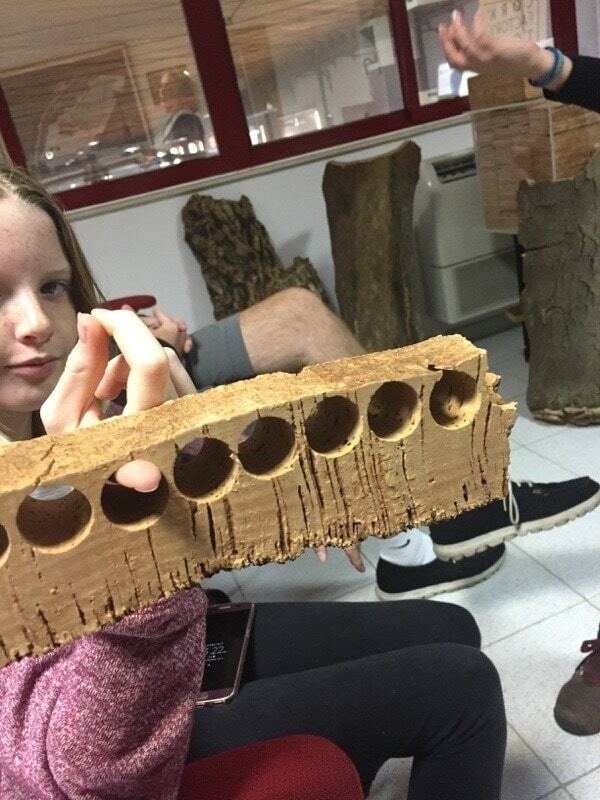 But in any case, we spent about 45 minutes in a classroom-type setting learning about the process of making cork before going to the factory floor. Growing cork is not for the impatient. After you plant the tree you have to wait 25 years until the first harvest. The first harvest is almost unusable and definitely not good enough for stoppers. The second harvest cannot be done for a minimum of ANOTHER 9 years and that harvest is also not fit for wine and champagne stoppers. The third harvest, 9 years after that, is the first one that yields stopper-quality cork. Do the math… that means you have to wait 43 years from planting until you have your harvest that’s worth much. Certainly not a get-rich-quick scheme, no ma’am. 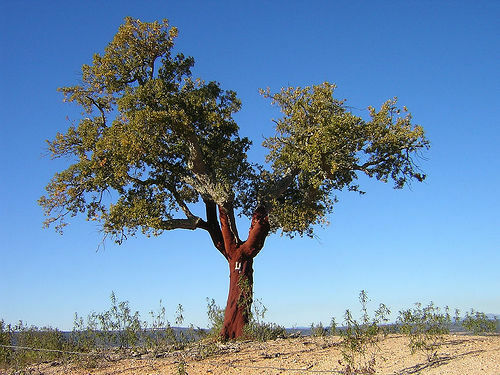 The cork tree is completely independent, it needs no watering or any human involvement. It grows solely in the Mediterranean region, with most of them in Portugal, some in Spain and a few in France, Italy and Northern Africa. Our guide told us that most of the cork produced and manufactured is done by family businesses because it’s been passed down from the older generations. The workers who harvest the cork make quite a good wage, earning up to 150 Euro a day. Whereas the minimum wage in Portugal is only 550 Euro a MONTH. Despite the high pay, they still have a hard time finding young workers who want to do the manual labor of harvesting cork. It takes years to train someone to do it correctly so cork harvesting can typically “run” in people’s families, the trade being passed down from father to son. But recruiting new cork harvesting workers is difficult. 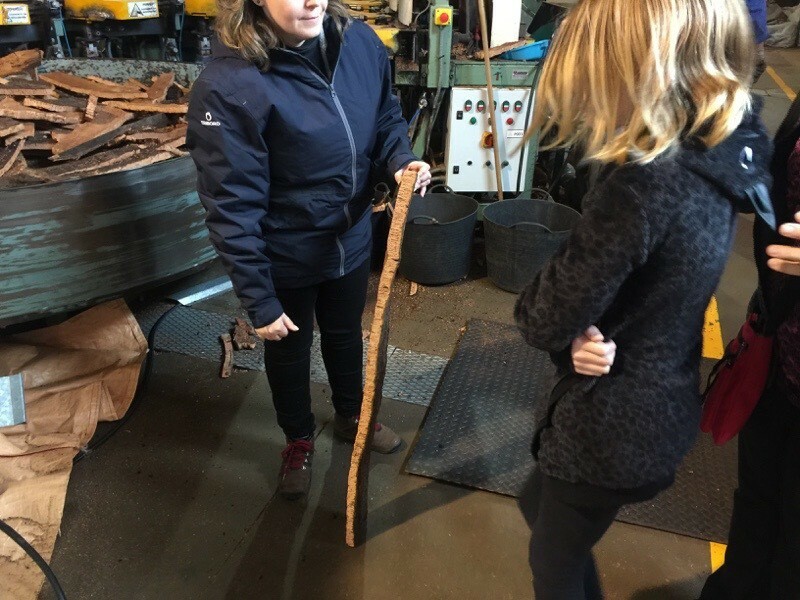 Our tour guide said young people are more interested in computers and the 21st century, than working in the hot sun, surgically removing bark from a tree. This is a cork tree. I think Ferdinand sat under one. Anyone else get that reference? This is the first harvest. Useless for good stoppers. In 3000 BC, cork was already being used in fishing tackle in China, Egypt, Babylon and Persia. In Italy, remains dating from the 4th century BC have been found that include artifacts such as floats, stoppers for casks, women’s footwear and roofing materials. Despite zillions of advances in technology and production since that time, the cork is still the best way to close up a wine or champagne bottle. It reminds me of the Panama Canal. One hundred years after they opened first one, they built the second one…. almost exactly like the first one. Turns out they just couldn’t find any better way to do it, even after all this time. Cork allows the wine to breathe, but not too much, it’s a natural substance that comes from the earth so it does not change the taste of the wine, and it expands perfectly to fit the bottle so it creates an excellent seal because cork always tries to go back to it’s original shape. So when it’s compressed to fit into the bottle, it’ll constantly seek to correct itself, providing the pressure needed to keep the bottle sealed. 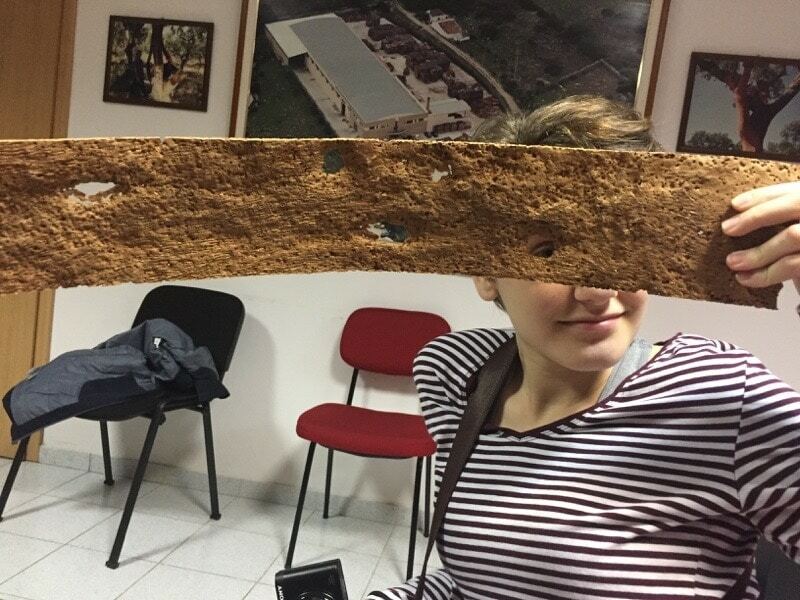 We learned that cork is also a highly sustainable product because harvesting it does not damage the tree. 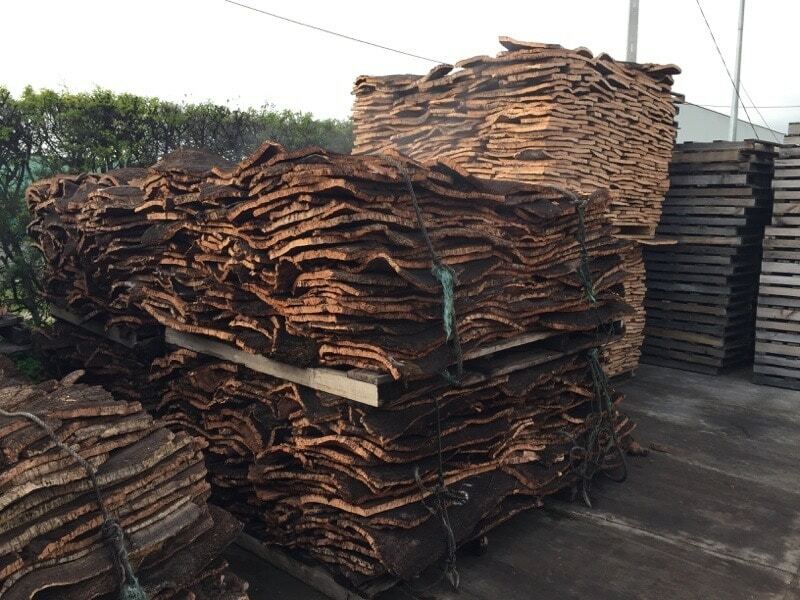 It is harvested purely from the bark and in fact they go to great lengths to protect the tree from disease because it’s such a valuable product that’s not easily replicated in a short period of time. 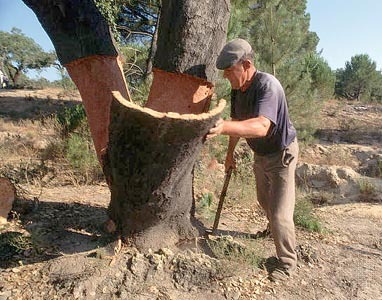 In Portugal it is illegal to cut down a cork tree even if it’s on your private property. For ANY reason. Harvesting the cork. A highly skilled man and his machete. But cork is not just used for stoppers, although that is the most valuable product that comes from the tree. The nuts of the tree are used to feed pigs, and the first two harvests that are not good enough for stoppers are used for flooring, and is also cut into granules used for insulation, soundproofing, bulletin boards and really cheap stoppers that are designed for alcohols with a short shelf life. Seventy percent of the total cork harvested ends up as stoppers. They use 100% of each harvest for something. In the lobby we sat on couches that were covered in a thin cork material. It’s very durable, yet soft and maintains heat so it feels a lot like smooth leather. Zoe, get off me, I’m trying to take a nap on a cork chair! 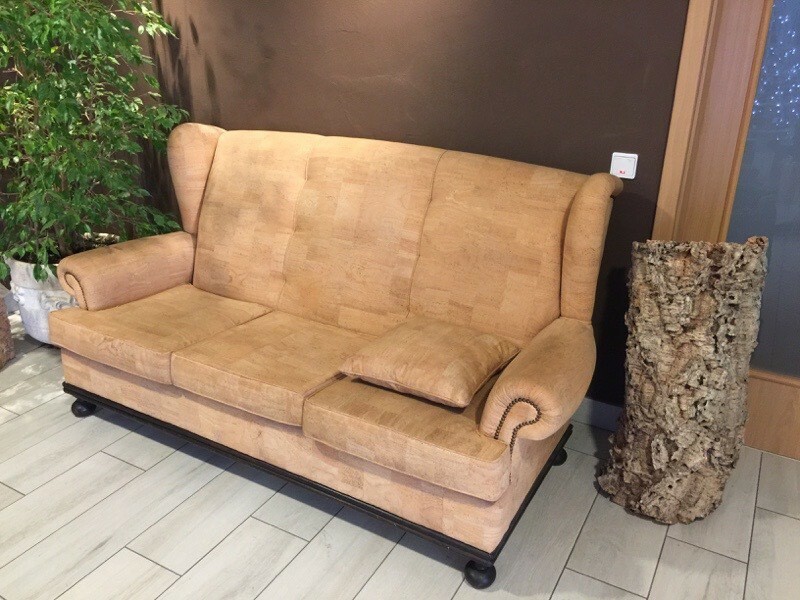 Cork couch. It was very soft and warm. You can see a big piece of cork there on the right .That was from the first or second harvest – not use-able for stoppers. Haley holding a piece of good cork. This is one 9-year harvest cross section where you can see the layers (each layer equals one year). There are various qualities of stoppers. The more of those cracks that you have in the layers, the lower the quality of the stopper made from it. This one, for instance, can not be used for high end wines or Champagnes. The process at this factory was not too complicated. They receive the cork from the farmers, which is harvested between May and August, during the warmest months. They cut it into pieces (bigger the better) and boil it at 100 degrees Celsius for 1 hour to remove all bacteria and to make it pliable. Then they lay it out to dry for 2-3 days, praying that it does not rain. Very hot and wet cork smells wonderful. This is the factory floor. Cork drying out after it’s hot bath. After it dries they then begin the cutting process that turns it into the usable product. Some stoppers are made from 100% cork. Other wine makers save money by use stoppers made of compressed cork granules and held together with glue. This is not a natural product because of the glue so it cannot touch the wine. So they put two small discs of real cork on the bottom of the stopper, where the wine will touch it. This allows for a cheaper stopper but a natural product (without glue in it) will be actually touching the wine and not impact the taste of the wine. At this factory they made the discs. That’s all. Just discs. The best corks can cost between 1 and 3 euro each, so you can see how some wine makers would not want to use a full-cork stopper but instead use a cheaper substitute. For the pieces that were not good enough to create discs they turned them into the granules. The granules are cut into different sizes depending on their use. 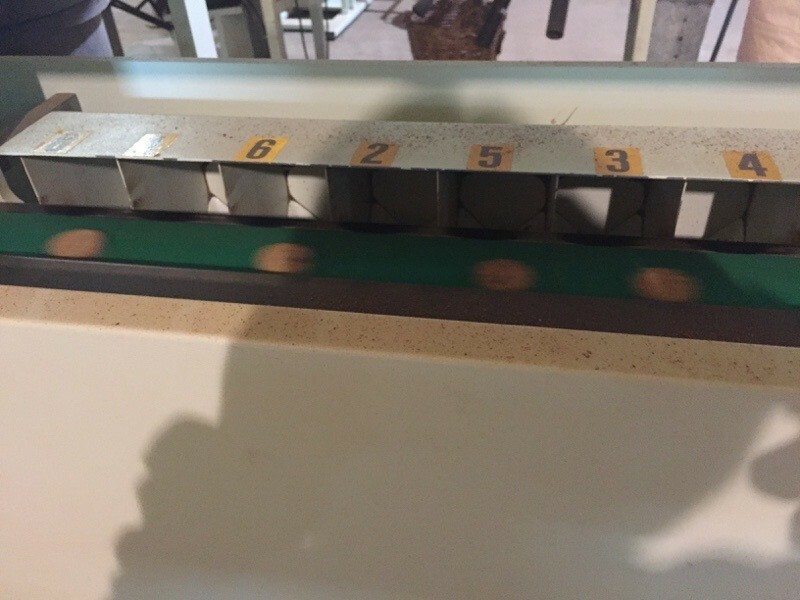 The guide is showing us how it’s sliced thin to make the discs. 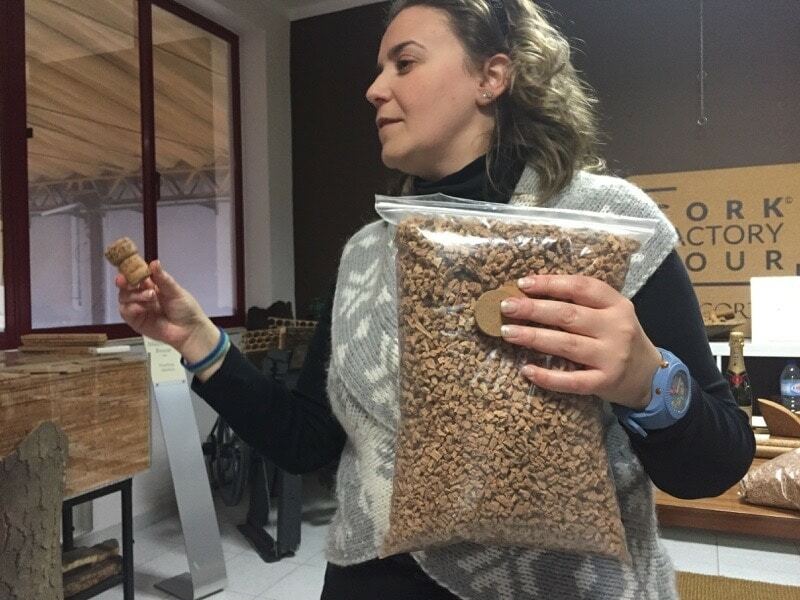 The tour guide is holding the bag of granules they make if the quality is not good enough for a stopper (in her right hand) or a disc (in her left hand). The final step in the disc-creation process is for a computer to take a picture of the disk, analyze it for density, shape, size, etc and sort it into a quality bin. But evidently even the computer eye cannot distinguish between natural circles that show up on the discs and little white circles that show evidence of fungus. The computer rejects all of them. So two ladies spend 8 hours a day sorting through the reject pile to pull out the true rejects and sending the rest of the discs through for bagging and sale. 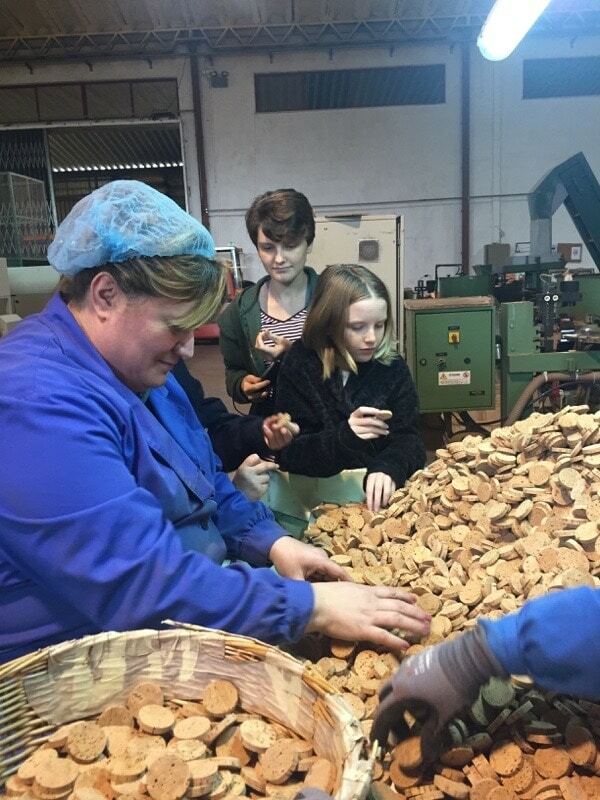 We helped them for a few minutes and I’m proud to say my two kids would easily be hired in a cork factory. So I think their future is all set. 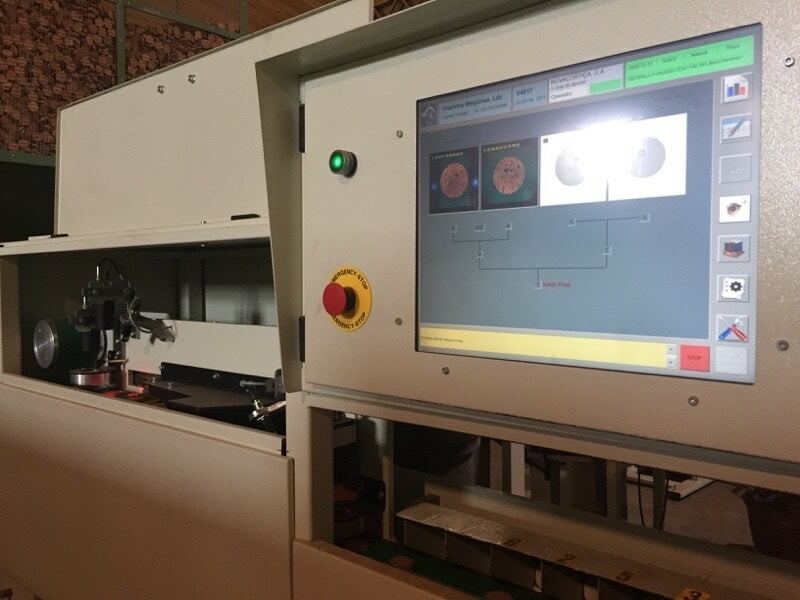 This machine takes a picture of the disc and analyzes it (in less than a second) for evidence of fungus. Then an air compressor shoots it into the right bin depending on quality. Those blurry things are discs. It’s a fast process. These are the discs they make at this factory. Here they are checking the rejects for the fungus. Most of them do not have it and can be used. We were able to take a few cork disks with us, which made Dan happy because they were; 1) free and; 2) small. One-suitcase travelers cannot be picking up massive souvenirs everywhere we go, although certain Mother Travelers do try hard. These bags are filled with the discs they make. 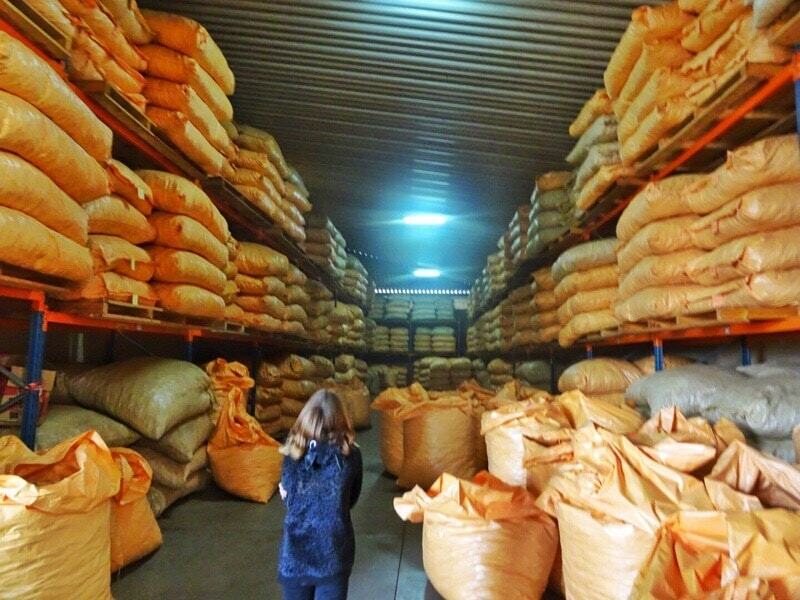 The guide said the room is warmer when it’s full of bags. This factory makes 1 million discs every day and it’s just a “medium sized” factory. So the field trip turned out to be very worthwhile, with Haley describing the day as “the coolest homeschool day I’ve had”. We’ll remind her of that next time she is apathetic to the prospect of seeing something new. Thanks to our tour we will never look at wine stoppers the same way again. Or bulletin boards! PS: Be sure to follow us on Instagram @shermantravel – managed by Haley! I will be taking a group of college students to Portugal in May. These students are dual major scholars in agriculture and lifecsviecnev and humanities and social sciences. 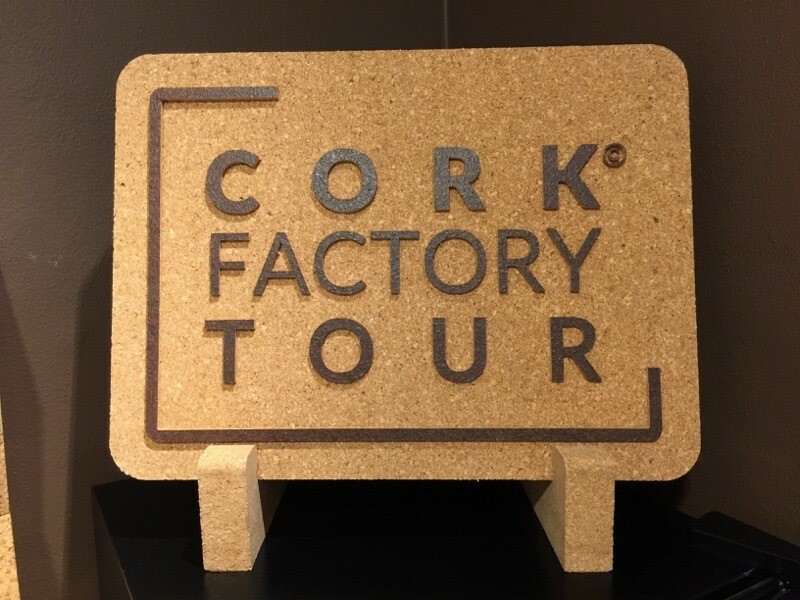 Where is this cork factory that you toured, as Inwould like to take them to a cork factory. Do they speak Englush and what is the price? I don’t recall the price but I don’t recall it being unreasonable. And it was all in English and it was GOOD English. It was one of our best tours. Hope it works out for you and your students.